In Disney's Animal Kingdom, Rodrigues fruitbats can be found on the Maharajah Jungle Trek. In general, bats are an excellent form of pest control, with some species dining on over 100 mosquitoes in one hour and rootworms, while fruitbats dispense seeds and pollinate flowers. Their assistance in agriculture is incalculable, and yet more than fifty percent of American bat species are endangered. One way to help these creatures is to construct a bat house for your backyard. 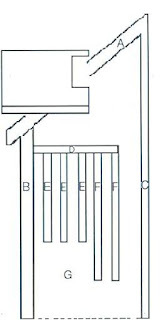 Spacing between the partitions should be constant throughout. All inner surfaces of the bat house should allow bats to get a firm foothold. Face the rough side of the lumber inwards, and carve small horizontal grooves at ½ inch intervals on the partitions' smooth sides. Apply a bead of silicone caulk along all exterior joints to prevent heat loss and increase the probability of occupancy. Place the house 10 – 15 feet above the ground. On the side of a building or pole works bests, trees are poor places for bat houses due to the threat of predators. Placement should allow the bat house to face east or southeast, in order for the house to catch the morning sun. Placement near a natural water source will also improve the possibility of inhabitation. Wow - excellent! You learn something new every day :).